A one-day climate summit was held at the United Nations headquarters in New York City yesterday ahead of the 69th General Assembly. Convened by Ban Ki-moon, the UN Secretary General and participant in Sunday’s Climate March, it drew more than one hundred heads of state from around the world to discuss ways to mitigate climate change. Speeches by dozens of dignitaries covered topics ranging from scientific findings to current and planned climate actions. After listing a variety of extreme weather events that have impacted the US recently, President Obama declared, “The climate is changing faster than our efforts to address it.” He went on to say, “There should be no question that the United States of America is stepping up to the plate. We recognize our role in creating this problem; we embrace our responsibility to combat it.” He pointed out his administration’s new E.P.A. regulation to cut carbon pollution from coal-fired power plants, the main source of greenhouse gas emissions in the US. President Obama also urged other countries to take action, saying, “We can only succeed in combating climate change if we are joined in this effort by every nation, developed and developing alike. Nobody gets a pass.” He specifically called on China to join the US in leading this effort. The US and China are world’s two largest economies and largest carbon polluters. The current international goal is to limit global warming to 2°C (3.6°F) above pre-industrial levels. Scientists say that if greenhouse gas emissions are not quickly and significantly reduced, the planet’s atmosphere could warm beyond that tipping point very soon. As the IPCC’s report on the Impacts and Vulnerabilities of Climate Change points out, a warmer world means more extreme weather events like droughts and floods, higher amounts of sea level rise, a decrease in the availability of fresh water, and even food shortages around the world. While a number of encouraging pledges were made at yesterday’s summit by a wide variety of countries, the real test will come next year at the U.N. Climate Change Conference in Paris. The objective there will be a legally binding global agreement that reduces greenhouse gas emissions. 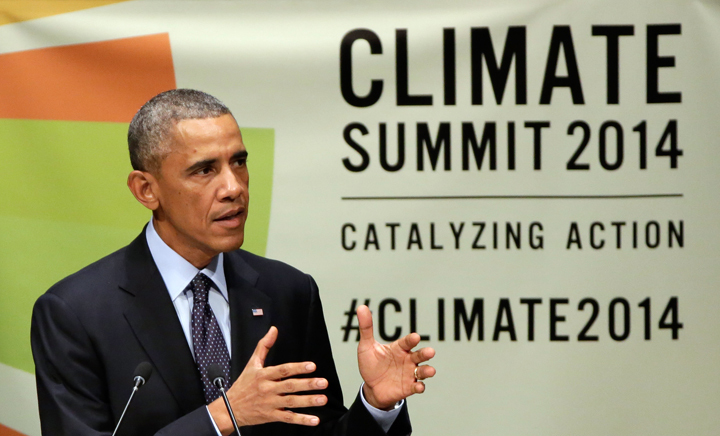 US President Barack Obama addresses the UN Climate Summit in NYC. Image Credit: AP Photo/R. Drew.